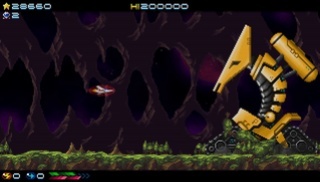 Developed by Locomalito and published by Abylight, Super Hydorah is a throwback to sidescrolling space shooters of the NES era, such as Gradius and Salamander, but is so much better than the games it tries to emulate. Believe it or not we actually liked this game more than Locomalito's previous Vita game, Cursed Castilla which we gave a very high level of recommendation to our readers. Continue reading our review to find out more! 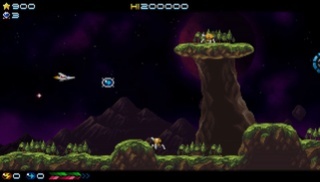 Super Hydorah is an 80's inspired retro shmup that plays alot like Gradius and Salamander and is equally as challenging which is fantastic for fans of retro games! The level design is genius and at times is even better than those found in the retro games Super Hydorah attempts to emulate! 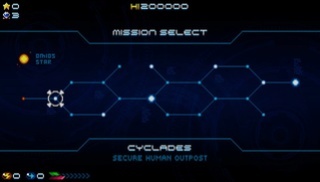 There are a ton of different enemies and stages that you'll be entertained for many hours. 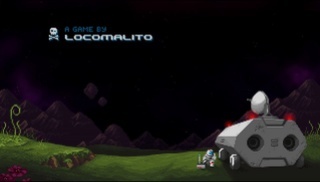 The game also has several different endings which adds a ton of replay value to the game! As for the gameplay itself, the game's power-up's and formula take many cues from the Gradius series. The bosses, of which there are tons, are unique and challenging and require good concentration and memory to learn their patterns to easily defeat them! The controls are easy to learn and work well for the game, and best of all Super Hydorah is PSTV compatible which always is a plus in our opinions! Visually the game looks unique in a truly good way! First of all the foreground is all done in the style of the classic 8-bit era with nostalgic enemies, weapons, and other aspects that'll make longtime gamers feel right at home, while the background looks like 16-32 bit CD quality. The backgrounds are highly detailed and remind us of some shmup's from the SEGA CD and SEGA Saturn era. The audio soundtrack is equally amazing and quite varied. We liked the bit of voice acting the game has as well. With flawlessly nostalgic gameplay, excellent controls, and a nearly perfect audio-visual presentation, Super Hydorah will have you hooked from the get-go, and its massive amount of content will keep you coming back for more! We give Super Hydorah for the Vita/PSTV a perfect level of recommendation! Our review is now live! As always be sure to leave us your thoughts in this comment section! A perfect score? Color me impressed, perhaps I'll need to purchase this when it receives a discount. Great review as always @Reanfan! Does anyone know if this will release on Switch? Great review by the way. Is there any chance this'll release on Switch? Sweet review btw @Reanfan. Excellent review. This actually looks good. Nice review lol. £17 is a little pricey, but I couldn't pass up such an enjoyable game. Wow, a perfect score? It must be an excellent game, then. Sweet review, @“Reanfan”! Dude this game sounds like da bomb! Thanks for all of your awesome comments you guys! @Pennsage Why'd you call Ruki Rena? He's never been Renafan as far as I'm aware. @Pennsage @StarOceanCrazy You guys are hilarious. Nice review boss! My hubby and I love this game and we completely agree with the perfect score you awarded it.